Welcome to the Step2 Top Toy Showdown. 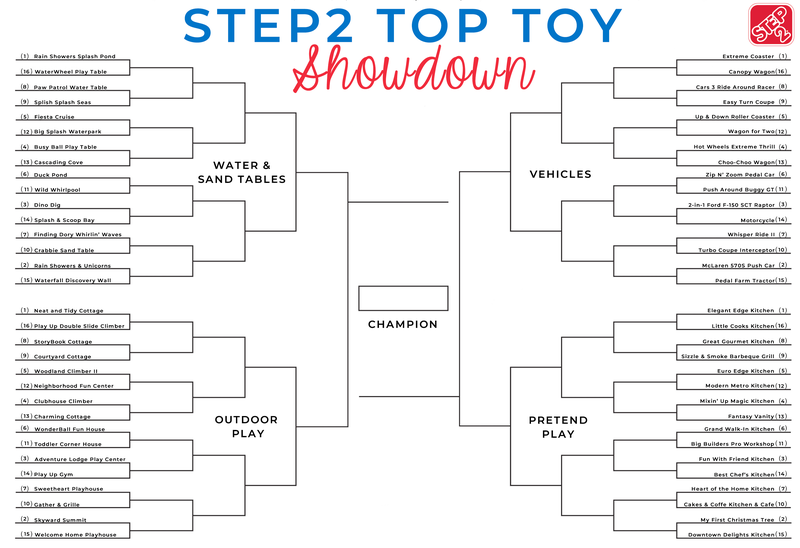 In our first ever Top Toy Showdown, we want your help deciding the top Step2 toy. Our staff chose 64 of our favorite toys from across the current Step2 product catalog (which is no easy task)! We then seeded them based on a variety of factors from newness to the different play benefits. Come back each round to help vote for your favorite toys. The voting period for the first round will open at 8:00 am ET on Tuesday (3/19) and will run until 8:00 pm ET on Wednesday (3/20). The winners will advance to the Second Round, and new polls will open on Friday (3/22). The fun doesn’t stop there. Whatever toy reigns supreme, will then become an upcoming giveaway. That’s right, your vote matters and can help us decide which toy you can win next! Your products are the best on the market. You have socialization skills covered. You also have the transportation area covered making things easier for the adults. Love step 2 toys there great made and my kids just love them ?? That was fun! Zip and Zoom pedal car is our next purchase! Fun poll! Lots of great toys to vote for! I really like these polls! Very fun and a great way to see what’s new! Love step 2 toys! My boys would be so happy and excited to win anyone of these toys. Thanks for the opportunity, my grandkids would love these! Some of those were tough to pick! And some were real close to each other! Fun polls.